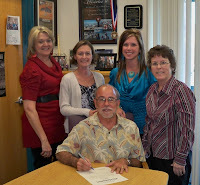 The Mayor signed the official proclamation Wednesday, Feb. 1 in the presence of the Winterfest Committee. Winterfest, now in its 27th year, is produced and hosted by the Lake Havasu Area Chamber of Commerce. The event is a 2-day street festival held on McCulloch Boulevard between Smoketree and Acoma Ave.
Winterfest features more than 250 vendors and organizations offering products, services and information. Festival foods are available and live entertainment including the annual Havasu Idol competition is also featured. The event times are from 10 a.m. to 5 p.m. on Sat., Feb. 11 and from 10 a.m. to 4 p.m. on Sunday, Feb. 12. There is no admission fee. For more information on this or any other Chamber of Commerce program, please call 8928-855-4115 or visit www.havasuchamber.com.